ProTrack, Pocket Recorder/Multitrack from Alesis. Alesis announces its new ProTrack Mobile Recording Kit is now shipping. The Alesis ProTrack Mobile Recording Kit combines the ProTrack handheld recorder for iPod with Alesis’ new AM2 Stereo Microphone Set. The kit is designed to enable musicians and recording engineers to record high-quality stereo sound directly to their iPod from a wide variety of sources. 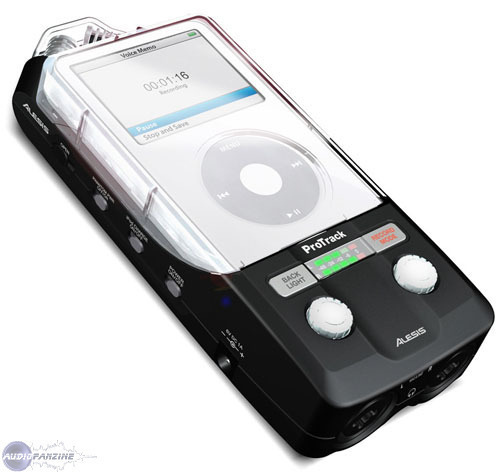 The ProTrack provides direct-to-iPod, stereo, digital recording in a portable, handheld form. Consumers can capture live audio with their iPod. 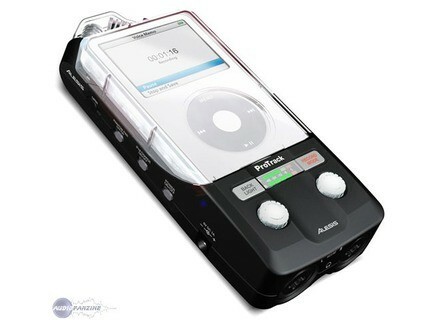 The ProTrack’s design integrates the iPod into the recorder and protective covers are designed to securely mount the user’s iPod to the recorder. Users can record stereo audio using the ProTrack’s onboard dual condenser microphones, which are fixed in XY-stereo configuration. While the onboard microphones are capable of capturing quality sound, the ProTrack Mobile Recording Kit includes the AM2 Stereo Microphone Set, a matched-stereo, cardioid condenser microphone kit with two AM2 microphones, windscreens, clips, a padded hard case and an XY-stereo mount. The ProTrack Mobile Recording Kit is available now from pro audio and musical instrument retailers at an MSRP of $399.99 and an estimated street price of $299.99. For more info on these products, check out www.alesis.com. [NAMM] Alesis iMultiMix 16 Alesis announced that its iMultiMix 16 USB mixer with professional mixing and direct-to-iPod recording is now available. [NAMM] SSL Matrix Solid State Logic will present its Matrix studio integration console at this year's Winter NAMM. [NAMM] AMT HR3 Harmonica Microphone AMT will release the HR3, the second generation of it's popular harmonica microphone line up, at the 2009 Winter NAMM.